Ulbuka® — a land of unexplored wilderness — welcomes any who dare discover its hidden secrets. Unexplored lands, undiscovered treasures, and untold dangers await those brave enough to set foot into the wilds, whether with the swords and sorcery of old, the bells of the primal Geomancers, or the arcane arts of the stalwart Rune Fencers. 2 New Jobs to master. 15 New Areas to Explore. New Reclamation System unlocks new content and resources as you explore and claim the lands of Ulbuka. Stake your claim and cultivate and harvest your own resources on your own personal piece of land. FINAL FANTASY XI © 2002-2013 SQUARE ENIX CO., LTD. All Rights Reserved. SEEKERS OF ADOULIN is a registered trademark or trademark of Square Enix Co., Ltd. FINAL FANTASY, SQUARE ENIX and the SQUARE ENIX logo are registered trademarks or trademarks of Square Enix Holding Co., Ltd. ILLUSTRATION: KENICHIRO TOMIYASU. 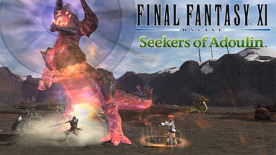 FINAL FANTASY XI is required in order to play the "Seekers of Adoulin" expansion. From the 8th July 2014 the game is available in English only.